I wanted to do another school related post that I think is applicable to a lot of you! I'm dorming this year, so the majority of the time I study in my room unless I'm at the library or study room in my dormatory. 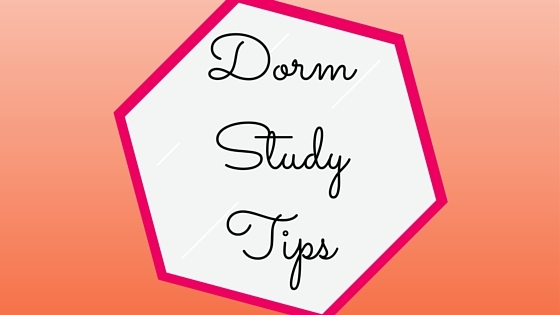 I wanted to share some of my tips for studying in a dorm room or a bedroom because it can be super difficult sometimes! I have a desk in my dorm that I use for most of my homework (unless I'm reading and lying on the floor or my bed). You want to make a space in your room that isn't your bed where you can do your homework. It should have good lighting, all your school supplies, and should force you to sit upright with good posture! My roommates use their bed for their homework, but one of them turned in an incomplete 84 point math assignment because she was distracted, didn't understand, and didn't end up doing it. I'm not saying that doing your homework at a desk will make you instantly smart and capable of getting all of your homework questions correct, but it will keep you more alert than when you're in your bed. Also, if you're doing your homework in bed, you're messing up your sleep signals too! This is a tip that you're going to have to figure out for yourself. Some people need absolute quiet to do their homework, others can do it while listening to music. For me, I like to have a bit of background noise, but no music (which makes my dorm room perfect!) Try to figure out how much noise you need in your room to best function, and try to emulate that in your space! The same roommate that didn't finish her math homework also skypes her boyfriend every night when she's doing homework. That may work for her, but it would be hella distracting for me! Try to minimize distractions and unnecessary technology because it'll help you focus a lot better! I have a desk lamp, and my desk is at a window so I have pretty decent lighting at my desk. You want it to be bright, so you are alert, and can see everything well! Also, if you're doing homework late at night and your desk is dark, you might end up falling asleep! I hope that this post was helpful for you! If it was, let me know in the comments below and also leave your tips below so I can read them! Don't forget to follow this blog on bloglovin for lots more! I can use these tips for working from home as well! Great tips honey!!!! yay! I'm glad you enjoyed this post! Did I Complete My Summer Bucket List? Subtle Smokey Everyday Makeup Tutorial!